New York Comic Con 2018 is now in full swing, and we are super jealous of those that are in NYC. Our love for NYCC has definitely dwindled in recent times, but getting the chance to hang out with our Designer Toy brethren & sisters is always a MUST any time of the year. Folks descending upon on New York City making us very jealous. We have many favourites in this world we live in, and we can without a doubt say that Nugglife is up there with the best of them. Nugglife will have a bunch of custom & original artwork with him on his NYCC booth #780. 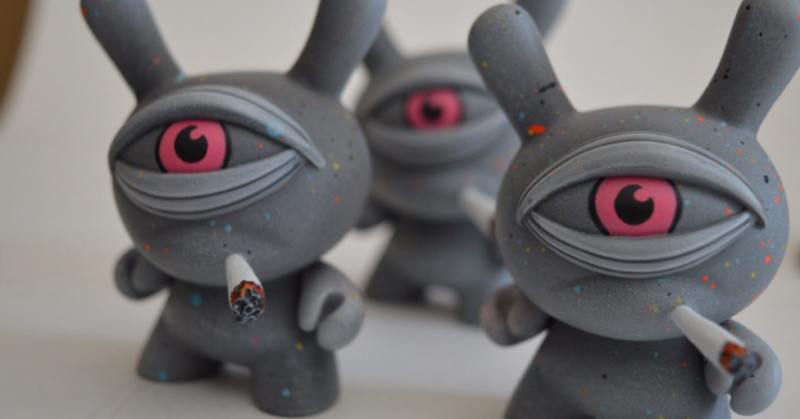 A range of custom Kidrobot Stony-eyed Dunny, gloriously coloured Nugs, and his original Stoney-eyed resin all-seeing pyramids! Also, how do you fancy winning yourself a $1800 custom?!? Nugglife is raffling off his Tree Fort Grow Op that won the Designer Toy Award for Best Non-Plastic in June 2018. You can purchase your $10 ticket into the raffle HERE. You can buy as many tickets as you’d like. Standing at 17inches tall this thing is a beast! The winner will be drawn live on Monday, OCT 8th at 4:20pm EST (9.20pm BST) via Live Streaming through Instagram & Facebook (@nugglife) and winner will be contacted that evening. Let’s not forget that Nugglife is a streetwear brand too, and they’ve brought the heat to NYCC with a whole host of awesome apparel that will notch up your cool points by at least 12. Hats, jackets, tees. Check them out below. If you’re not heading to NYCC this weekend, you can purchase these on the Nugglife store HERE. Nugglife can be found on Instagram HERE and Facebook HERE!